It’s the first of its kind at a university or museum in Ohio and Michigan and possibly the only life-size periodic table in the world built and filled by a community. The 800-pound, interactive periodic table bolted to the wall inside the main entrance to The University of Toledo’s Wolfe Hall features 118 LED-illuminated glass boxes. 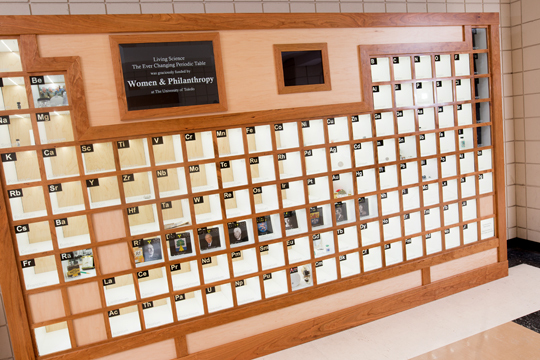 “Living Science: The Ever-Changing Periodic Table” is located in the main entrance of Wolfe Hall. Each box represents an element, and members of the community are invited to fill the boxes with examples of how each element relates to everyday life and current events. 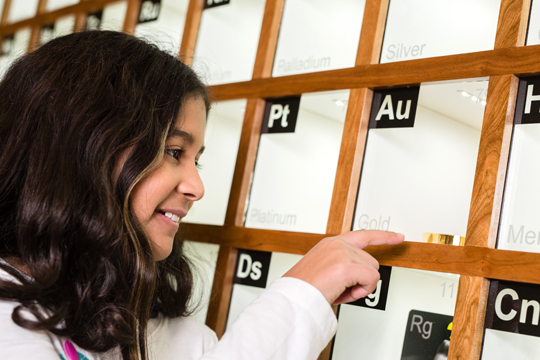 The display features touch-screen technology that allows visitors to explore a variety of apps that share stories and videos about the elements, contents of the element boxes, and who donated the items for each element. 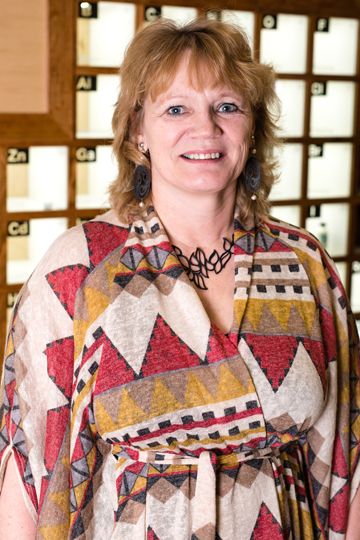 The display titled “Living Science: The Ever-Changing Periodic Table” was funded by a $31,465 grant from UT’s Women & Philanthropy, a collaborative effort of area women and the University’s Division of Advancement that supports institutional initiatives. As part of the grant for the project, Kirschbaum can reimburse donors up to $50 for an item. Eight-year-old Destiny Zamora furnished the element box labeled “Au” with a gold-plated coin minted to celebrate the 100th year of Mexico’s independence, a gold medal, and a picture of Scrooge McDuck diving into his money vault. Alyson Lautar, a UT student studying pharmacy, donated a smoke detector to represent americium, which is made in nuclear reactors and was first produced in 1945 as part of the Manhattan Project. The symbol for the element on the periodic table is Am. Destiny Zamora, 8, pointed to the gold element box, which she filled. Dr. Steven Toth, a lecturer and lead expert at the University of Michigan in Flint who earned his bachelor’s degree and PhD in chemistry from UT, is donating a bottle of Flint water for the box representing lead to help teach about the city’s recent water crisis. The symbol for lead is Pb. Joe Slater, labor and employment law expert and the Eugene N. Balk Professor of Law and Values in the UT College of Law, designed the radium display that contains an old alarm clock, paint brush, New Haven watch box, black-and-white factory photo, description of legal cases, and program from the play titled “Radium Girls.” Radium’s symbol is Ra on the periodic table. 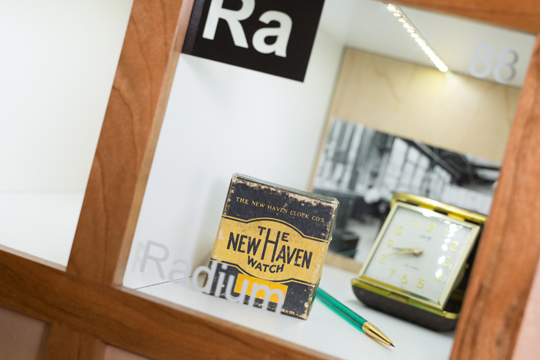 The display in the radium box was created by Joe Slater, the UT Eugene N. Balk Professor of Law and Values. Matt Hafner, the local carpenter who built the massive periodic table in seven weeks, wants to do something for hafnium simply because it’s similar to his last name. Hafnium is Hf on the periodic table. A radiologist supplied a small bottle of gadodiamide, a gadolinium (Gd) that is used as a contrast agent in MRIs. Gadolinium’s box also contains a CD and the magnetic Pokémon called Magneton as it’s one of the few magnetic elements. To make a contribution to the periodic table, contact Kirschbaum at kristin.kirschbaum@utoledo.edu or 419.530.7847. For more information, go to utoledo.edu/nsm/ic/periodictable.html. This entry was posted on Wednesday, January 4th, 2017 at 3:47 am and is filed under Advancement, Law, Natural Sciences and Mathematics, News, UToday .